I’m going full bore now on the woodpile. Today I finished the wood I pile under the outside roof of the garage. When I stepped back to look at it, it reminded me of the Grand Canyon, with its distinctive bands of color and texture representing various geological strata. 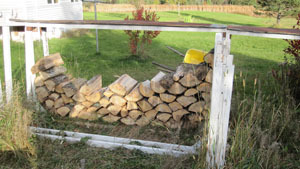 This sort of thing happens because of the way I go about the firewood project. For the past many years, I’ve been felling the trees in my woodlot, and cutting them up into 8′ lengths. These I load onto the forks of the dozer, and load onto my funky old yellow trailer that I gave $40 bucks for some years back. 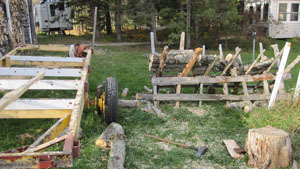 When the trailer is full, I haul it back to the homestead as close to where I’ll eventually stack the wood as I can. The logs I can lift go onto my poor old sawbuck. I built this thing years ago, and things break on it every year. It is pretty rickety, and sometimes I’m a little off on my sawing, and I slice through one of the uprights. It is built so I can remove a few screws and remove a section, replace it, and be back in business in no time. Once the sawbuck is loaded up, I go through it with my chainsaw, sawing the accumulated small stuff every 16″. 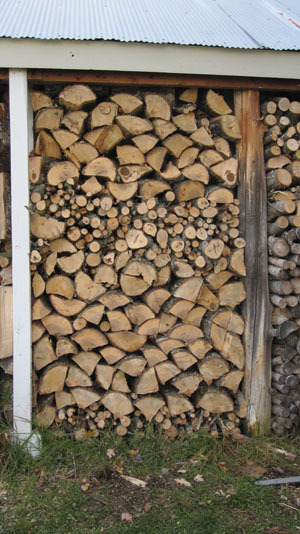 I tend to stack all the small stuff once it is sawn, which is why there are layers in the woodpile. Some loads have more small stuff, and some have less. If the weather and my equipment cooperate, I should be finishing up after 4 or 5 more loads from the woods. The next few loads should be relatively easy to get out, but as the project matures, I’ll be driving deeper into the woods to get at the trees I knocked down, which will involve some road building. It is all just part of the project, though, and I’m finding I’m enjoying the process, not that I’m finally getting going on it. This entry was posted on Sunday, October 7th, 2012 at 9:06 pm and is filed under Uncategorized. You can follow any responses to this entry through the RSS 2.0 feed. You can leave a response, or trackback from your own site.